How does it make you feel and what goes in your mind when I say: Cleaning up air pollution may strengthen global warming. Bacteria are evolving to eat the plastic we dump in the oceans. Some corals are flourishing in a time of global warming. Coal and gas are far more harmful than nuclear. First of all, all of it is true, it is supported by scientists. Scientists are fallible humans who are just trying to figure things out in the constant tug of war of deficit and surplus of information. It’s a learning process. Second of all, I for one felt lost, what do I do with this information? I was polarized just like Mulder and Scully from the X-files, chasing after the truth, sometimes ending up lost along the way, wanting to believe. Good news is, at least we know more. With the pace at which we are working, I will be arrogant enough to say that we will figure things out within my lifetime. I’d rather be hopeful than scared. Are you arrogant or hopeful? I’d also read: Keeping an open mind; Do you take climate science with a grain of salt; Is the earth adapting to climate change? Look around you. There is stuff you can’t see but it exists, like magic. In this side of our world, the human notions of ‘seeing is believing’ fail to exist. This, my friend, is the microscopic world, the one naked to the human eye. Except for humans who have technology at their disposal that help them see this world, such as by using a microscope. We do however manage to see shadows of the Muscae volitantes (Latin: “flying flies”), or mouches volantes (from the French), commonly known as floaters. These are deposits within the eye’s vitreous humour. It’s amazing how technology helps us see things we can’t normally see. For instance, we know why the wings of a Morpho butterfly are blue even if they contain no blue pigment. The physics of light at the nanoscale tells us that the structures/ridges on their wings have a peculiar structure that refracts light giving out blue and cancelling out other colors of light, a phenomenon called constructive interference. A similar thing happens to gold when we see it on a nanoscale. Colors of monodispersed gold nanoparticles are not golden at all! The microscopic world also puts a spell on the environment we live in. The spores that mushrooms give out as a part of their reproduction cycle are nature’s very own cloud seeders. Aerosols too do the same, 90 % of which have natural origins such as the sea salt, dust, and volcanic ash, the first two being the most abundant aerosols on the planet. The clouds that these cloud seeders create reflect about a quarter of the Sun’s energy back to space. Aerosols however have a love and hate relationship with global warming. Depending on their physical structure, they either aid or prevent warming/cooling. For more information, see my article ‘Polluted atmospheric layer in the making‘. It also works the other way round. Warming of oceans could kill phytoplankton, and eventually all life on the planet. This is because these microscopic marine plants are the base of several aquatic food webs, they provide two-thirds of the planet’s total atmospheric oxygen and absorb as much carbon dioxide as tropical rainforests. If the water temperature of the world’s oceans increases by six degrees Celsius, it could stop oxygen production by phytoplankton by disrupting the process of photosynthesis. The macro is deeply connected to the micro, whether you see it or not. We have slowly entered into the depths of Microbial ecology (or environmental microbiology). It is the ecology of microorganisms: their relationship with one another and with their environment. Phytoplanktons provide oxygen and absorb carbon dioxide, chemosynthetic microbes living in the dark corners of our world provide energy and carbon to the other organisms. There are decomposers that keep the nutrient cycle (one of the biogeochemical cycles) running. An estimated 5 trillion trillion bacteria reside on this planet. They are in the oceans and the soils. A handful of soil contains about 10 billion bacteria! These keep our soils healthy and ultimately keep us healthy. Overuse of certain chemical fertilizers, fungicides, herbicides, pesticides are rendering soils infertile as they kill these microbes. Technology has a solution for this too. Scientists are now able to map genetic sequences of soil microorganisms, understand what they actually do and how to grow them, and reintroduce them back to the soil. Last but not the least are the tiny worlds inside our own houses. Molds, mildews, bacteria, and dust mites are potential human health hazards. These are called bioaerosols and are found in homes. These can be controlled just like the indoor non-bio aerosols that are harmful to our environment. Consumer products such as Fingernail polish, perfumes, mouthwashes, pump hair sprays, and roll-on and stick deodorants emit Volatile Organic Compounds (VOCs), which not only affect indoor air quality which may cause short- and long-term adverse health effects, but can also act as greenhouse gases, and cause smog. Microorganisms and the natural environment. P. A. Trudinger, B. Bubela. Mineralium Deposita November 1967, Volume 2, Issue 3, pp 147-157. This paper looks good to read, however I had no access to the entire text. Do you take climate science with a grain of salt? If you say ‘yes’ to the title of this post, it’s a good thing. ‘Science is not something you should believe in. You should be skeptic about everything.’, an advice offered to me once. Science is based on facts – there is no question of belief in science. Science helps you find the truth. It is logic and not blind faith. It’s not about consensus either. Stuff that you don’t understand seems magical for a reason. The reason is our lack of understanding and it astounds us. Want to see some magic? See the video below. When Copernicus said that the sun was at the center of our solar system instead of the earth, when Galileo supported him, imagine what would have happened if everyone had believed the consensus. We probably wouldn’t have advanced in astronomy as much as we do now. This fell on my ears when I listened to Real Time with Bill Maher as Bill questioned the speaker Bret Stephens (a columnist) why he won’t believe the scientists who know climate science. But as Rheinhard says, the heliocentric solar model won because it had evidence to back it up, and the same goes with climate change. So far the evidence that I’ve seen, which is available for anyone with internet to view – the chart where the CO2 has been rising like it never has before, and that greenhouse gas effect is real, I think CO2 reduction is tough but necessary. It would be scary to think that so many scientists might have twisted scientific facts. Some say it is the solar spots and why not, sun has major influence on our climate. It doesn’t have to be just a single contributing factor. 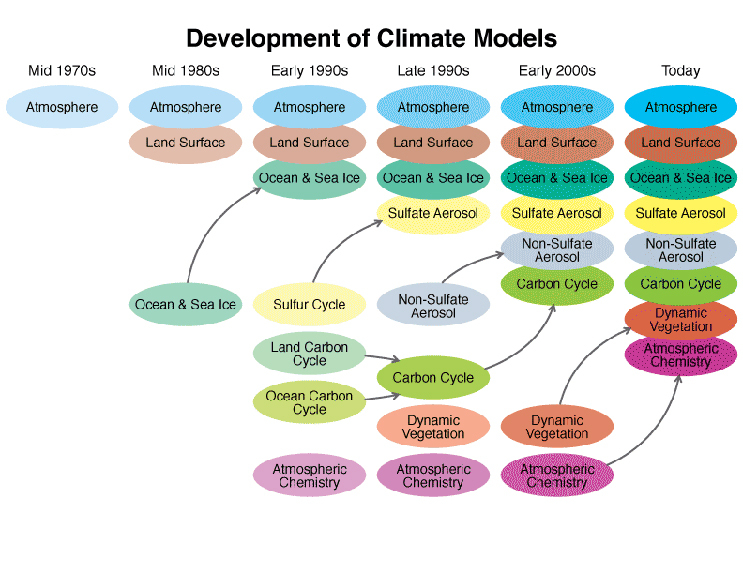 Climate science has evolved (see figure below) and is being supported by newer techniques such as NASA’s operation IceBridge. We are learning more and more about our atmosphere, land and water. The more we know, the better our climate models get. The better our climate models are, the better prepared we are with the help of the predictions that these climate models fetch. Our oceans are carbon dioxide sinks. We do understand the chemistry that takes place in this case but we barely know the ocean in entirety. (There are waterfalls and lakes at the bottom of the sea! There’s an ocean at the core of the Earth! AAAAAAAA!) It’s only been three decades since we started studying what constitutes 70% of our Earth’s surface. May be the ocean will take care of this all, may be it won’t. “As a fraction of your tax dollar today, what is the total cost of all spaceborne telescopes, planetary probes, the rovers on Mars, the International Space Station, the space shuttle, telescopes yet to orbit, and missions yet to fly?’ Answer: one-half of one percent of each tax dollar. Half a penny. I’d prefer it were more: perhaps two cents on the dollar. Even during the storied Apollo era, peak NASA spending amounted to little more than four cents on the tax dollar.” From Space Chronicles, p. 25. Take climate science with a grain of salt? Do you take any other subject of science with a grain of salt? I do because that propels me into understanding it better rather than believing it on face value. “You should eat everything that is served in your plate! Don’t waste anything.”, said my mother and she has been saying it ever since I was an infant. Many of us can relate to this in one form or the other, from one person or the other. Ever wondered why we waste so much? Why do we waste food, water or anything for that matter? Is it something innate to us? What could possibly be the psychology behind such a behavior? When I was about 20 years old, I heard a yoga instructor say, “Your stomach is not a garbage bin, if you don’t need it, don’t push it inside you, do not eat it. You are causing more harm that good.” She was right, in a way. Only problem I think with this piece of advice is that it needed an iteration of the question ‘why?’ Why did we feel obligated to not waste food? Why is it morally right to not waste food? If we have to waste food, why do we harm our own bodies for being morally right? Why do we create so much food needlessly? What do we think when we do all this? Did this ever happen to you? Did you ever experience scarcity? I have. We had a 24 hour water supply for a few days, when I moved to a new place. The new society was yet to have a good foundation of rules. After our society was fully populated, new rules were made. Water was then only supplied for two hours, one hour each, morning and evening. We felt the scarcity. It was uncomfortable. We bought new storage tanks to store water. My mother made sure that nobody wasted water in the house. She’s been always the same, she must have experienced scarcity long back but we, the ones who have not ever lived in a world like she has, do not know of scarcity but we are experiencing it now. She always coaxed me into building things from waste, to save resources. She, like many mothers or people alike out there have continued this legacy, for the good. A layperson may ask, “We have so much water in the oceans, then why do people say ‘Save Water’?